Since 1886, the wool and cotton Greek Fisherman caps has been hand made in an ancient town outside Athens, Greece. For over 30 years, the Aegean Company has been transporting the caps to San Francisco and supplying retailers throughout North America. 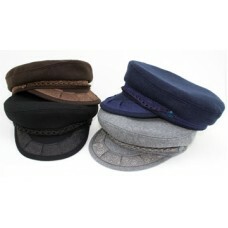 Aegean is the only authentic Greek Fisherman’s Cap Company in the USA. While the Greek Fisherman is a well known character of the Western World, one does not need to be Greek, or a fisherman, to wear these caps. Greek Fisherman caps come in a variety of materials and colors. The caps stylish features include trims in the visor and a braided cord in front that attaches to matching buttons. The wool Greek Fisherman cap comes in colors including black, gray, brown and navy; and the perfect accent in winter and fall seasons. The cotton Greek Fisherman comes in black, white, tan, navy, and denim, and ideal for summer and spring seasons.